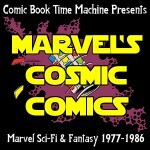 Using Star Wars as a guideline, we’re exploring comic books based on licensed properties that Marvel Comics published from 1977 to 1986. It’s a nightmare! But whose nightmare is it? If you said Ben’s, you’d be right. The Human Fly takes on greedy businessmen and really, really careless, incompetent reporters. At Niagara Falls. And none of it is as good as it sounds.